IISG 2014 interns: Where are they now? Every summer since 2012, Illinois-Indiana Sea Grant has offered opportunities for undergraduate students to get on-the-ground work experience in their field of study. In 2014, IISG hired six interns who worked closely with outreach specialists and helped with projects ranging from website development to community needs assessments. Checking in with a few of these former interns reveals that placing undergraduates in a fully-immersed extension or science program can be a rewarding and life-changing opportunity. Jacob (left photo) worked with Tomas Höök, IISG associate director for research, to create the Fish Atlas, a GIS tool that compiles fish catch data from Indiana, Illinois, Wisconsin and Michigan. At the annual GIS day at Purdue University, Jacob’s poster received an undergraduate award for his work on the Fish Atlas website and the processes for developing a mobile website. Following a 2-year career in civil engineering, Jacob recently moved to the Peoria, Illinois area to prepare for graduate school. Read more about Jacob’s intern experience. How did the internship help you in your career? Working with IISG helped me develop a self-driven work ethic to accomplish work related goals. I also learned a lot about professionalism by working alongside some very talented staff members and graduate students. What is your favorite memory of the internship? One of my most memorable experiences was going out on Lake Michigan with Jay Beugly to launch and retrieve the IISG buoy in Michigan City, Indiana. I had a great time going out on the lake, and helping with an awesome program. Mark (right, in right photo), alongside El Lower (see below), worked with Caitie Nigrelli, environmental social scientist, ( center, in right photo) to conduct a needs assessment with local stakeholders of Trenton Channel in the Detroit area After graduating, Mark completed a Master of Public Health in environmental and occupational health and epidemiology at Saint Louis University. Mark works for an environmental consulting company conducting exposure assessments on remediation projects. Read more about Mark and El’s summer experiences. How did your internship help you in your career? The lessons from my internship that have been most valuable in my career are the importance of understanding stakeholder concerns and effectively communicating with the public about environmental remediation projects. Working around environmental hazards, it can be easy to underestimate the concerns that people may have about hazards that they are not familiar with. It is so important to listen to and respond to the concerns of the people that will be affected by a project so that everyone knows that it is being completed in the safest way possible. What is the favorite memory of your internship? My favorite memory is definitely the trip that Catie Nigrelli, El Lower, and I took to Trenton, Michigan to conduct in-person interviews of residents and other stakeholders involved in the remediation of the Trenton Channel in the Detroit River. We were able to tour the channel by boat, take a sunrise ride with a rowing team, and enjoy some lovely waterfront patios. We spoke to many wonderful people and it was great to learn about each of their connections to the channel. 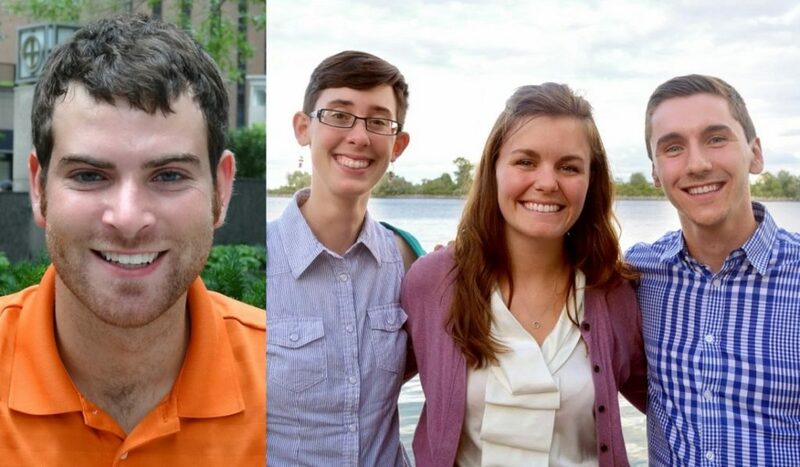 After graduating, El Lower (left, in right photo) worked as a research assistant for the Urban Environmental Equity Project at the University of Illinois, where she conducted stakeholder interviews about Great Lakes cleanup work using skills learned with IISG. EL worked on this study from 2014 until its conclusion in 2016, when she turned her focus to finishing graduate work in the U of I College of Agricultural, Consumer, and Environmental Sciences. El was recently contracted by American Journal Experts as an environmental studies editor. The IISG internship was a bit of a turning point for my career goals—I had had no idea environmental social science was a field that even existed before working with Caitie. The combination of research, writing, and community outreach was exactly what I wanted to do with my career, and I have been heading in that direction ever since. My favorite memories from the internship were definitely from the interviews we ran on the Detroit River—we spent about a week in the Downriver area talking with community members and environmental advocates, many of whom were gracious enough to invite us into their homes for their interviews. One (very early) morning we were invited out on a boat ride at dawn by members of the local rowing club—taking pictures of the sun coming up over the Canadian border from out on the water was an experience I won’t soon forget!